Native to the Sierra Nevada from the Mt. Shasta area of California up into Oregon, it prefers damp soils on the edges of meadows. It can also be found along the edges of streams and rivers in areas that are not saturated, but never seem to dry out. Rarely exceeding 3 feet, most stems are closer to 2 to 2.5 feet. 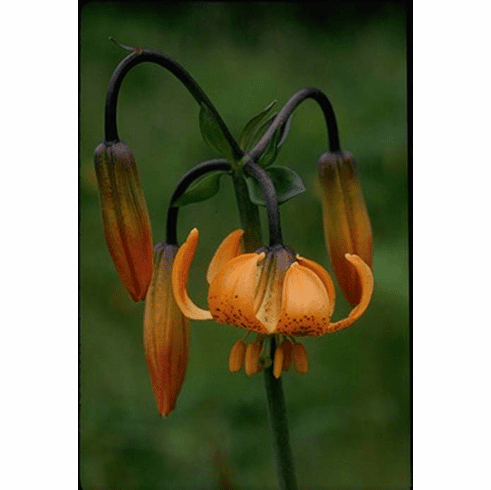 Flowers are strongly recurved and are deeper in color approaching more of a golden-orange or melon, are smaller in size than L. columbianum and it also sports much shorter anthers than L. columbianum. Photo courtesyof and copyright by Jo-Anne Ordano @California Academy of Sciences. Used with permission.